I know I am about a week late in posting this, but it's better late than never right? This year's Deer Creek Open Water Marathon Swim was amazing! This was my third year swimming in the event and it was by far the best. The morning started early, arriving at Deer Creek State Park at about 6:00am to help get things set up before the other swimmers started showing up. It was cold! I had on a light jacket and was wishing that I would have worn a sweatshirt. Luckily the water temperature was warmer than the air temperature. Once the sun came out, the weather was perfect. After getting things set up, I found my paddler (my friend Jonathan) and we got him set up with his kayak, flag and life jacket and hauled the kayak down to the boat ramp. This year my wife and brother decided to swim as well so we were busy getting everyone ready and the start time really creeped up on me. I found myself scrambling to get my equipment together, put on some sunscreen and have a pre-race Gatorade Prime. I finally got into the water with just minutes to spare. I would have liked to get in a little sooner to warm up and find a good start position. The new staggered start times were very popular with everyone I talked to and really did a lot to thin out the swimmers and support boats. Last year it was so crowded and I actually got hit by a couple support boats. There were some fast swimmers that showed up! I got passed by a handful of 5K swimmers (who had started 5 or 10 minutes after the 10K swimmers). I tried to keep up with some of them and draft, but decided I didn't want to waste a lot of energy keeping up with them only a mile or so into the swim, so I let them go. I was almost to the 5K turnaround before I saw my paddler. When he caught up with me he told me how he had flipped his kayak, lost his keys, water and snacks. He managed to trade kayaks with my dad (who was paddling for my brother) and catch up with me. At this point I had another Gatorade Prime before taking off again. The water level was so high that the 5K turnaround was almost to the very end of the bay. As I got near the buoy I found myself swimming through submerged plants and bushes and had to move further into the center of the bay to avoid them. They buoys themselves were a huge improvement over past year. The new buoys were easy to spot because they are much larger than the old makers, they are fluorescent orange and are well marked and easy to read. After the 5K turnaround I started catching and passing some of the other 10K swimmers. 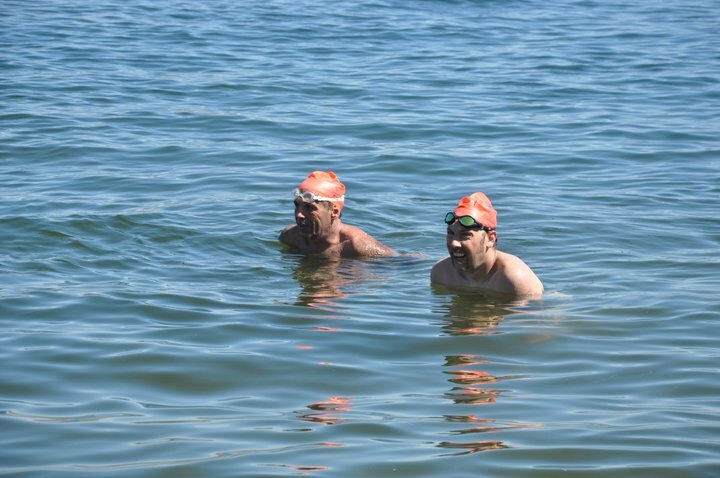 Bob Needham and I "leap-frogged" for a while, taking turns passing and being passed, until he finally settled in right behind me and stayed with me until the end of the swim. From this point until the finish was pretty uneventful. I found a good rhythm and stopped a few more times to refuel. For nutrition this year I went 100% Gatorade Prime. They are pretty similar in calories and carbs to an energy gel, but since it is in liquid form it is a lot easier and faster to swallow. Last year the gels made my stomach a little sick and I didn't have that problem at all this year. I was wondering if/when Bob would make a move to pass me as we neared the finish. With about 25 yards to go, I saw him pulling up to my right side. I buried my head in the water, not taking any breaths, and pushed it HARD to the finish and barely out-touched him by one second. One of the advantages of bilateral breathing is that you can keep an eye on your competition on both sides. If I had only been breathing on my "strong" side to the left, I wouldn't have seen him until it was too late. Bob went on to swim another 10K the next morning at Horsetooth in Colorado. Hats off to Jim Hubbard for putting together another great race. There were a lot of awesome volunteers and some amazing sponsors. 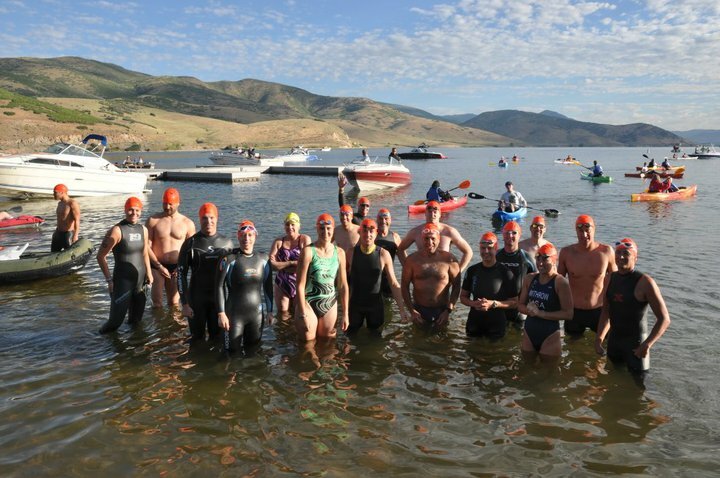 This was the first open water race for a lot of people and, from what I have been hearing, they all had a great time and are officially "hooked". Like me, they are already looking forward to the 2011 swim.